Apple would likely release the iPhone XI sometime mid-September 2018. It’s likely that there will be an opportunity for Apple fans to pre-order the new device. Right now, the exact date of the release of iPhone XI is unknown but we hope Apple will stick to its September release date moments. As you know, so much have been written and said about Apple iPhone XI in the past few weeks. Here are the complete stuff you should be looking to see in the device as it lands in the market in a few weeks. There’s going to be a larger screen 6.5-inch LCD is what leaks postulate, instead of OLED. The design type could be aluminum for the frame of the device instead of stainless steel that we’ve seen in the past. Expect less top-end materials for the device. iPhone XI could arrive with a button-less bezel-lite design this time around. Don’t be too quick to assume that Apple will scrape an eye-catching design this time; the company has been known to follow design traditions for several editions of smartphones. For screen resolution, there is the reported higher one, landing in the 480-500 pixels per inch. Remember, the iPhone X has 458 ppi, which shows that things in this area will go up a notch. For sure, there will be a single dual rear camera. However, there are rumors that the iPhone XI is coming with triple camera lenses to the rear! Some even suggest that it will not be until 2019 when the company is ready to release those kinds of smartphones. We don’t underestimate Apple. Google Pixel 2 and Huawei P20 devices beat the iPhone X camera setup. So we expect that Apple will step up its game here, in the form of strong but subtle camera improvements. They do that with each device release and we expect that also this time. Likely, there will be tweaks to the already known front TrueDepth camera system. Likely not, but trust Apple to bring rational changes to Apple iPhone XI camera department. 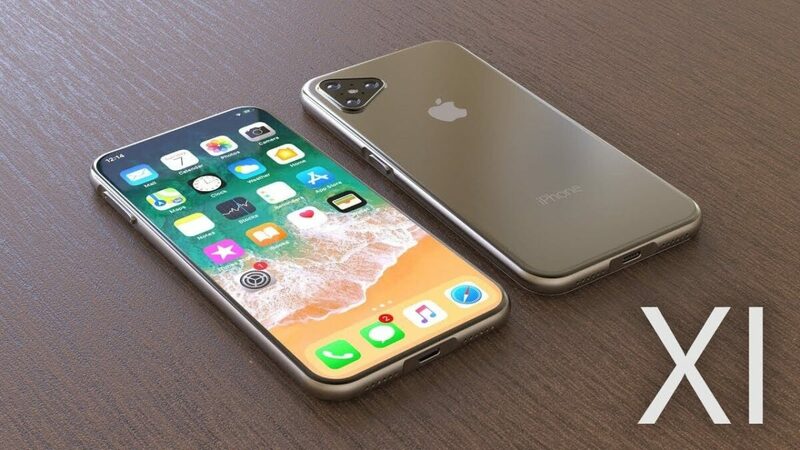 As speculations have it, iPhone XI is the biggest out of the three smartphones Apple will release in September, and since reports have it that one of those phones will carry triple rear camera lenses, it makes sense to believe that it belongs to iPhone XI. The smartphone will be given the power to take better pictures in dull atmosphere. The iPhone XI is expected to have the power to run faster than all other Android phones, though, with the release of Android pie, some analysts say the new Android will make iPhones appear slower than Android smartphones. As we know, for now, Apple’s A11 Bionic chip is the fastest smartphone processor, ditching Android to the second place. Apple has made a promise of releasing another chip (A12) with the next smartphone releases. With that, some are saying that Apple is ready to create even more power gap between iPhone and Android. iPhone XI is presumed to possess 4GB RAM, 64GB internal storage, which can be increased up to 256GB. There will also be a chance for the 512GB option for the iPhone XI, just like Samsung has done recently. How Much Will iPhone XI Cost? Looking at how things went with iPhone X and using that as a gauge, it seems rational that the price of iPhone XI will be around $900 to $1000 or more. Many people were willing to pay for the last edition of Apple’s release and the price was just a little lower. Apple knows that people will do the same again this time around. So it makes sense to believe that iPhone XI will be sold for at least $950 in the smartphone market. However, suffice to say that some analyst believes that Apple will “adopt a more aggressive price policy” in 2018. We wait to see how that pans out and trust that we will give you more information at that time.